This card includes another image which was embossed in clear embossing powder for a subtle, yet clear image. 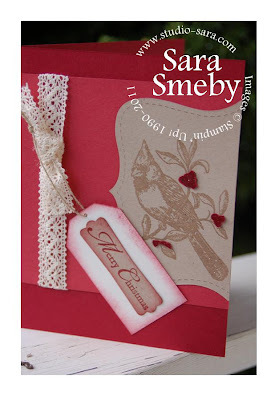 The berries were likewise embossed in clear embossing powder (on Cherry Cobbler card stock), snipped out and adhered to the cardinal image. The cardinal image was fed through the Big Shot, using the Top Note die, which gives it that shape. Quick and easy! 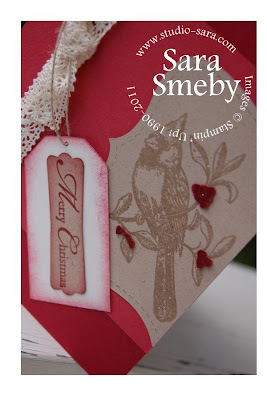 Our sentiment also comes from A Cardinal Christmas and was inked in Cherry Cobbler and then the Crumb Cake piece was punched using the Modern Label punch. Cherry Cobbler was used to sponge some ink along the Very Vanilla tag. Some time soon, I'll post a video showing how I achieved that extra-long tag (using my normal tag punch!). Simple and easy and a great way to sssttttrrrreeeettttttcccchhhh your supplies... I love the homey look of the Victoria Crochet Trim, which I used here with my stand-by, Linen Thread (I must order miles of that every year!). Finally, used my Color Coach to guide me in my color choice. Rose Red is a companion color for Cherry Cobbler. Phew! Accessories: Big Shot, Top Note Bigz die, Clear embossing powder, heat tool, Victoria Crochet Trim, Linen Thread, Stampin' Sponge, Modern Label, 1/16-inch circle and Tag punches. Hope you're able to enjoy some of the magic of this season! Beautiful card Sara! Love that image too and the lace trim is just perfect for it.